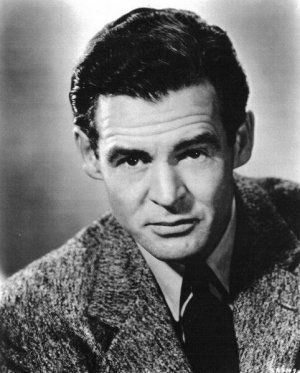 Robert Ryan, movie tough guy extraordinaire, is the focus of today’s Summer Under the Stars lineup over on TCM. Though best known for roles in such classic Westerns as The Professionals (1966) and The Wild Bunch (1969), and war films such as The Dirty Dozen (1967), Ryan played a wide variety of characters throughout his career. In fact, his only Academy Award nomination came from his first major part, as an anti-Semitic American soldier who kills a Jewish man in Crossfire (1947–airing at 1PM tomorrow, if you’re interested). 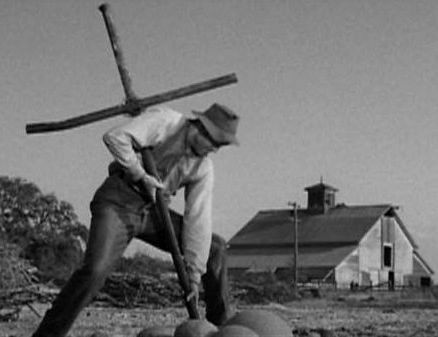 A scandalous film upon its release, based on the equally scandalous (and widely banned) novel of the same name by Erskine Caldwell, God’s Little Acre tells the story of Georgia farmer Ty Ty Walden (Ryan), who has spent much of his adult life digging up his small farm in search of a missing treasure. Meanwhile, he seems incapable of noticing that his family is falling apart around him: his children detest his unrealistic dream, sexual misbehavior runs rampant, and the family is dirt-poor because Ty Ty refuses to farm his land. I have not read the source novel, but based on the movie, the book has some surface similarities to Caldwell’s 1932 novel Tobacco Road, which (I have to be honest here) I detested. Now, Southern literature has always been my main area of interest and study (that, and feminist theory), and in my six-plus years of higher education, I’ve been exposed to a wide array of Southern authors and novels. And I have only ever come across two Southern writers whose work I simply could not stand. One of these is William Faulkner, and the other, as I’ve not-so-subtly hinted, is Caldwell. It’s hard to fully explain why I dislike these two authors so much, but I’ll give it a quick shot. In a nutshell, I find Faulkner to be wordy, self-adulating, and highly overrated; Caldwell, on the other hand, seems more dedicated to shocking his reader than actually telling a compelling story. And as an Alabama native, I don’t find hearty, stereotypical generalizations of Southerners to be particularly intriguing. Because of Code regulations, much of the content of the novel is excised from or altered for the film. The more overtly sexual themes are, of course, removed almost entirely (though we still get to see plenty of Tina Louise’s heaving breasts as sexpot Griselda), and the violence is toned down. 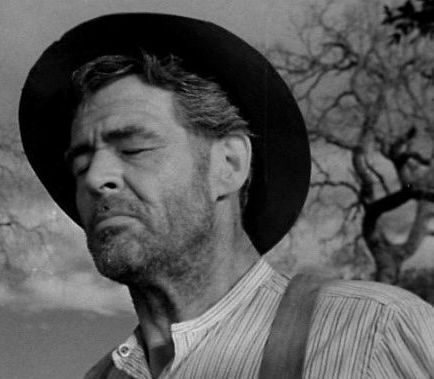 All of this results in a rather unrealistic “happy ending” being tacked on to the end of the movie, which ultimately weakens what could have been a really gritty statement about the lives of poor Southern farmers during the Great Depression. This is not a “great” film, at least by my own personal standards, but Ryan’s performance as Ty Ty is undeniably powerful. The movie also features great performances from Buddy Hackett, Louise (in her film debut), and a young Michael Landon, in his pre-Bonanza days. All in all, this one’s worth a viewing just to see this talented cast at work. I had to pick this movie- I mean, look at the title? So, before we even look at the plot or themes, we have to give props for creativity. Looking at the synopsis for this movie, we see a boy who goes through a lot. He loses his parents during the blitzkrieg, but doesn’t know it for some time. He gets passed around to various relatives (reminds me of Heidi…) until he stays with his grandfather. The day he finds out that his parents have died, however, his hair mysteriously turns green. With his green hair he faces isolation and judgment from the townspeople. So, this plot I like on principle, depressing as it is. I’m thinking this is not a fuzzy film. However, I have to say that I kind of like the premise, even if it is bizarre. Here’s why. This child has endured a lot of difficulty, and then reacts to the news that he has lost his parents. That’s a pretty crushing blow for a child. His reaction is not violent or harmful to anyone else- only to him. As reactions go, it’s not even really frightening. It’s just green. His history, his circumstances are impacting who he is, but not determining everything. Society’s response? Isolation. You aren’t exactly the same, so we don’t like you. Well, he did not control the blitz. He didn’t even dye his hair green. If he did, who would that hurt? Does green hair really make a difference? Not really. I like this film for it’s social reality check, even if the plot is a bit nonsensical (one of the best ways to do a reality check, in my opinion, sometimes is to be nonsensical). People are different. It doesn’t mean it has to hurt other people. And it doesn’t mean they necessarily wanted to defy the “norm.” Sometimes it’s important to gather information instead of just ostracizing. I recommend this one, because it’s an interesting way to make a rather interesting point. Hopefully, it won’t be as depressing as it sounds.